An American flag above the White House flew at full-staff early on Monday after the death of Sen. John McCain, R-Ariz. Later the White House issued a proclamation lowering flags to half-staff. This combination of pictures created on Monday shows the U.S. flag above the White House. But on Monday morning the flag atop the White House was back at full-staff, causing some to ask whether Trump's strained relationship with McCain had played into the decision to not keep it lowered. The lack of a proclamation was viewed by some as a disrespectful act reflecting the president's dislike for McCain, which Trump continued to express publicly, even as recently as last week. 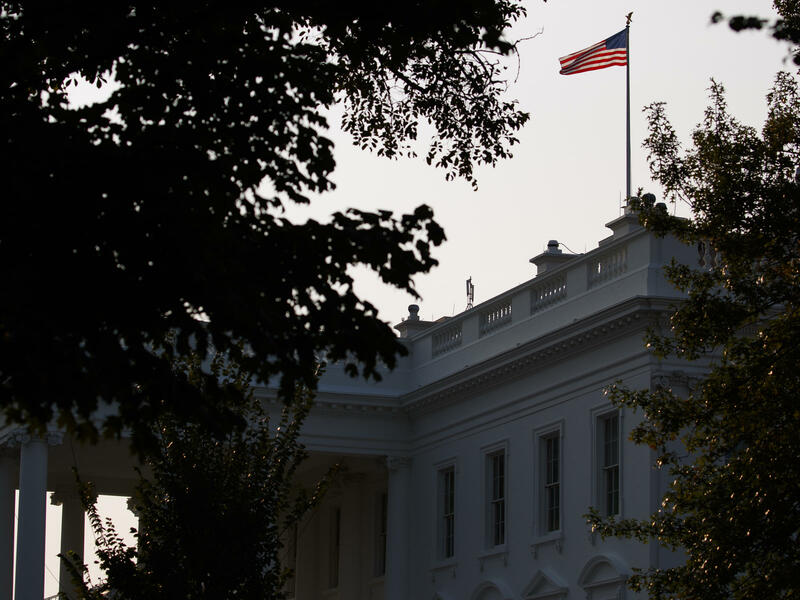 Hours after reporters questioned the White House about the move and the president ignored multiple press attempts to ask his reaction to McCain's death, the White House flag was eventually lowered to half-staff Monday afternoon. Trump said in a statement released shortly afterward: "Despite our differences on policy and politics, I respect Senator John McCain's service to our country and, in his honor, have signed a proclamation to fly the flag of the United States at half-staff until the day of his interment." Until that point, Trump had not issued a formal statement on McCain or commented on his service to the country, instead tweeting brief condolences Saturday to the senator's family. Later Monday evening at a dinner with evangelical leaders, Trump made his first public comments since the senator's death Saturday. "We very much appreciate everything that Senator McCain has done for our country," the president said. "Our hearts and prayers are going to the family," Trump also said, echoing his tweet. "There's going to be a lot of activity over the next number of days." The dust-up over the flag was viewed as particularly insulting by veterans. McCain was a retired captain in the Navy and the son and grandson of two four-star Navy admirals. He was held for 5 1/2 years as a prisoner of war in Vietnam after the attack aircraft he was piloting was shot down during a bombing raid over Hanoi. He was tortured but refused early release because it would have meant leaving ahead of other soldiers who had been captured before him. American Legion National Commander Denise Rohan issued a letter before Trump's late afternoon written statement, appealing to the president to follow the custom he had used in recent deaths of national figures. "The American Legion urges the White House to follow long-established protocol following the death of prominent government officials," she wrote. "Mr. President, just this year, you released presidential proclamations noting the deaths of Barbara Bush and Billy Graham. Senator John McCain was an American hero and cherished member of The American Legion." The veterans group AMVETS also issued a statement calling the president's actions since McCain's death deeply disappointing. "It's outrageous that the White House would mark American hero John McCain's death with a two-sentence tweet, making no mention of his heroic and inspiring life," said AMVETS National Executive Director Joe Chenelly. "And by lowering flags for not one second more than the bare minimum required by law, despite a long-standing tradition of lowering flags until the funeral, the White House is openly showcasing its blatant disrespect for Senator McCain's many decades of service and sacrifice to our country as well as the service of all his fellow veterans." And in what could be viewed as a subtle slap at Trump, the Canadian Embassy in Washington also posted a picture showing that it had lowered its flag to honor McCain.
" Senator John McCain was a long-serving U.S. Senator, naval officer, strong advocate for NATO, and a good friend to Canada. The flag at the Embassy has been lowered to half-mast in his honour," the embassy tweeted. This week McCain will lie in state in both the U.S. and Arizona capitols and will be memorialized at a funeral at his family's church in Phoenix and at a service at the National Cathedral in Washington, D.C. He will be buried at the cemetery at the U.S. Naval Academy in Annapolis, Md., on Sunday. According to the U.S. Code, the rules for a member of Congress state that flags are to be lowered on the day of the death plus one additional day. In other instances the White House has issued a proclamation extending the period to keep the flags at half-staff. It was no secret that the president and McCain frequently clashed. The Washington Post reported that when White House press secretary Sarah Sanders and other officials initially prepared a statement in Trump's name praising McCain, the president rejected that plan, opting instead for his Saturday tweet. Senate Majority Leader Mitch McConnell, R-Ky., and Senate Minority Leader Chuck Schumer, D-N.Y., sent a joint letter to the Department of Defense on Sunday requesting that flags "at all government buildings and installations" remain at half-staff through McCain's burial on Sunday. "We've received the letter and we'll be working with Senator Schumer and Senator McConnell," said Tom Crosson, a Pentagon spokesman. But with the White House proclamation issued late on Monday, the Pentagon can point to that as the directive responsive to the congressional request.